TORONTO, November 1, 2014—Tonight marked the 23rd annual Cathay Ball Gala, presented by CIBC, a glamorous black-tie event celebrating Mon Sheong Foundation’s half-century anniversary in serving the community. Over 1,300 guests attended the “Golden Celebration” themed gala and enjoyed the celebration with a time travel tunnel, sumptuous multicultural cuisine, great live music and spectacular performances. 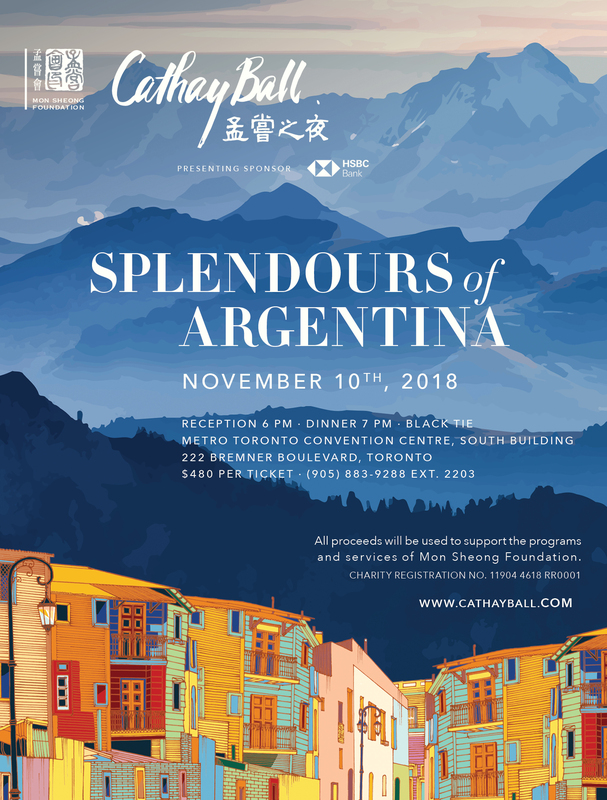 This year’s Cathay Ball showcased the multiculturalism of Toronto where Mon Sheong Foundation, Ontario’s first registered Chinese Canadian charity built its roots. Mon Sheong continues to improve the daily lives of many seniors, caregivers and youth through their services and programs. Tonight’s gala is both a celebration and testament to their contributions to the community. Mon Sheong Foundation anticipates raising $500,000 from the charity gala in support of their ongoing services, programs and centres in GTA. Their motto: “Caring for the old and nurturing the young” has been Mon Sheong’s mission statement over the last 50 years and they continue to stay committed to their goals. In his opening speech, Tim Kwan, Chairman of Mon Sheong Foundation highlighted the major services Mon Sheong is offering to the GTA community including its Long-Term Care Centres, Adult Day Centre, Chinese School, Youth Group, Community & Volunteer Services Centres and the newly built Care Complex which houses the Assisted Living Units, Private Care and Charity Care services. Mr. Kwan also took the opportunity to thank the many individuals who helped made the Gala possible, including the Honourable Vivienne Poy, the honourary chair of this year’s Cathay Ball and founder of this spectacular gala event in 1992. “Vivienne’s contributions have helped the Cathay Ball become one of the grandest annual fundraisers and allowed more people in the community to learn and contribute to Mon Sheong,” he said. 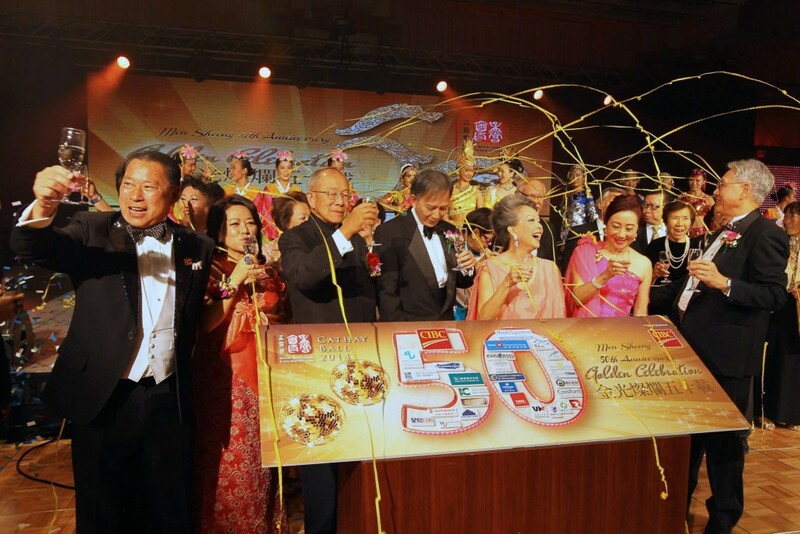 Mr. Kwan also thanked the four co-chairs of Cathay Ball: Mrs. Doris Chan, First Vice-Chairman of Mon Sheong Foundation; Mr. Frank Chau, President of Mon Sheong Foundation; Mr. Eddie Tsang, First Vice-President of Mon Sheong Foundation and Mrs. Jo-Cy Lee, Director of Mon Sheong Foundation: “Thank you for your tremendous hard work in making tonight’s Cathay Ball the grandest it has ever been”. The gala kicked-off its night with a breathtaking performance by the Yang Yang Dancing Studio, followed by Little Pear Garden Collective who performed a classical Chinese dance titled “The Flying Aspara”. The Brazilian Dancing Group wowed guests with their fast-rhythm Brazilian dance. Featured artist and singer, Eleanor McCain won guests over with her melodic and passionate singing while The Laura Lynn Band provided live music that was the perfect accompaniment for the night. To showcase Mon Sheong’s milestones over the last 50 years, a photo exhibition resembling a Time Travel Tunnel will showcase many precious moments captured in photographs. Guests of the gala were able to participate in this commemoration by collecting stamps on their time travel “passports”. Those who collected all five stamps qualified for the grand prize draw. The crowd cheered as the lucky winner won a world-class cruise trip for two. Esteemed guests browsed and bid on over 100 unique silent auction items. Two special draw prizes valued at $10,000 each were given to two winners including limited edition designer items and business class round-trip tickets from Toronto to Hong Kong. Exciting raffle draws complemented the night. Winners for these raffle draws will be announced on Friday, November 7th in major Chinese newspapers and on the Mon Sheong website (www.monsheong.org). The Cathay Ball was made possible by the support of sponsors including Presenting Sponsor CIBC; Diamond Sponsor MediSystem Pharmacy; Gold and Printing Sponsor Four L Graphics and Gold Sponsor BMO Financial Group. The organizing committee of the 2014 Cathay Ball thanks all sponsors for their continuous support, enabling Mon Sheong to continue serving the community with quality services.